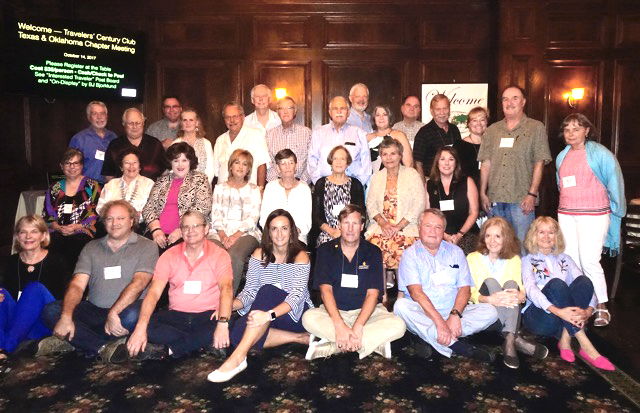 The Texas & Oklahoma Chapter’s 4Q 2017 luncheon meeting was held Oct. 14 at Magliano’s Little Italy Restaurant in Dallas. In total, 34 members and guests attended and enjoyed some fine Italian food. Our featured speaker was fellow TX/OK chapter member Dr. P. Kay Champion, MD who presented a fascinating story titled “Trapped in Yap.” His story began with a chronicle of travel that he and his wife Barbara had through several Micronesia islands, ending at Yap. While this was quite interesting, the audience was wondering what “trapped” was about. Well … while on Yap, Dr. Champion had a serious and sudden medical emergency which caused him to be admitted to the small Yap hospital. His story of the lack of adequate medical care, even lack of attention by the medical staff, got us all thinking about what can happen as we travel the less-developed parts of the world. In effect, Dr. Champion was his own doctor at the time. He then continued the story by telling of his transfer to Hawaii by special medical evacuation aircraft, which had to come from Australia to pick him up. The first aircraft had a mechanical issue when it arrived on Yap and a second one had to be dispatched. All this took time, and it was several days from the onset of his medical emergency until he was finally admitted to a proper hospital in Hawaii. Fortunately the story ended well, and Dr. Champion has no lingering medical issues. With this backdrop, the audience had an interesting follow-on discussion about travel medical insurance, medical evacuation services, and dealing with travel emergencies, medical and otherwise. We also held a two-minute-per-person around-the-room travel story-tell, of whatever nature the person wished. All the stories were interesting and clearly were told from the cherished memories of each person. An “On Display” of a Coco de Mer from Zanzibar and a Prayer Wheel from Tibet was brought by BJ Bjorklund for the perusal of members. Paul Clites presented a summary of the recent chapter member survey concerning the chapter meeting frequency, locations, content and meal and venue cost/quality trade-offs. A detailed report of the survey results was subsequently sent by email to all chapter members the following day. The next quarterly meeting of the TX/OK Chapter will be held on Jan. 13 in the Houston area. The venue and details will be announced in due course. If members of other chapters would like to attend, just contact Paul Clites so we can welcome y’all.